Northern Regional College student, 18-year old Eamon McLaughlin, credits the support he has received at the College for helping him secure an exciting four-year soccer scholarship with Division 1 college, California State University. Local football ace Eamon McLoughlin is pictured signing his contract with California State University, which secures him a four-year all-expenses-paid scholarship playing Division 1 soccer and studying International Business. In July, Limavady-native Eamon will jet off to the sunnier climes of Bakersfield, California to play college soccer whilst studying International Business with a full scholarship which covers the costs of his tuition, accommodation, food and sporting gear. California State was not the only university to offer Eamon the opportunity of a lifetime, he received numerous offers from other regions including New York and Texas, as well as other Californian institutions. Eamon, who has had a life-long love of the beautiful game, is currently in his third year of a Level 3 BTEC in Sports and Exercise Science at Northern Regional College. His studies at the College gave him the opportunity to take his training to the next level through video analysis and GPS tracking of his performance. Following stints with Ballymena United, Crusaders and Glentoran, Eamon played in international tournaments such as the Copa Costa Brava with Northern Regional College and was scouted while playing for the College in the College & Universities Football League (CUFL). 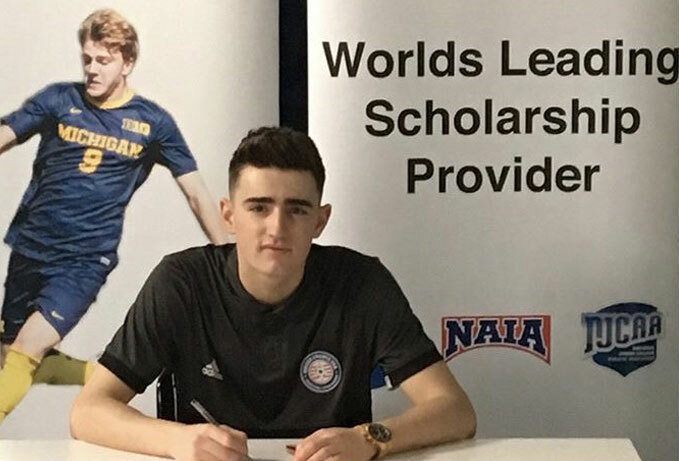 The teenager’s performances for Northern Regional College helped gain him a contract with Soccer Chance USA (SCUSA), one of the world’s leading providers of soccer scholarships to USA, who handled all his promotion and correspondence with American Universities. Eamon worked closely with SCUSA National Scout Connor McCullough to help negotiate a Full Scholarship to one of the top Division 1 schools in the state of California. Also a lecturer at Northern Regional College, McCullough has now set up a number of links with California-based schools for future NRC students to have the opportunity to follow in Eamon’s footsteps.